With the firing of Juan Nieves yesterday the question has been raised of who will replace him. With it being so early in the season there are not many names that are available, but on NESN yesterday Rob Bradford mentioned a fan favorite, Jason Varitek. While this mention of the name got people excited all over twitter it was quickly shut down by Mrs. Varitek. Catherine was tweeted by a fan saying that he was bummed that Tek was not an option for the pitching coach job and that he wanted her to persuade him to take the job. She responded quickly by retweeting the tweet and quoting "No way. Love him at home!!! He retired 3 years ago... Has no interest in working full time any time soon. #TimeToPlay". 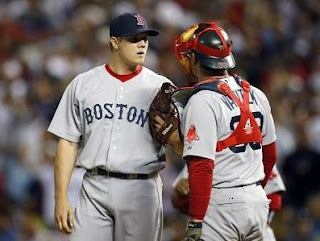 While this may disappoint many Red Sox fans it would be an interesting dynamic having a catcher become a pitching coach. I personally see Tek making a comeback to the Red Sox, but not for a few more years, potentially as a manager. Catchers are often the smartest players on the team and they are essentially an on the field manager which would transition to being a manager more than a pitching coach. It appears that the Red Sox front office will have to look elsewhere to find their next pitching coach because Jason Varitek is not looking to make a comeback anytime soon. Enjoy that retirement Jason, but remember the Fenway Faithful will always want you back.